The ultra-competitive White House press corps is displaying something rare and refreshing: Solidarity. 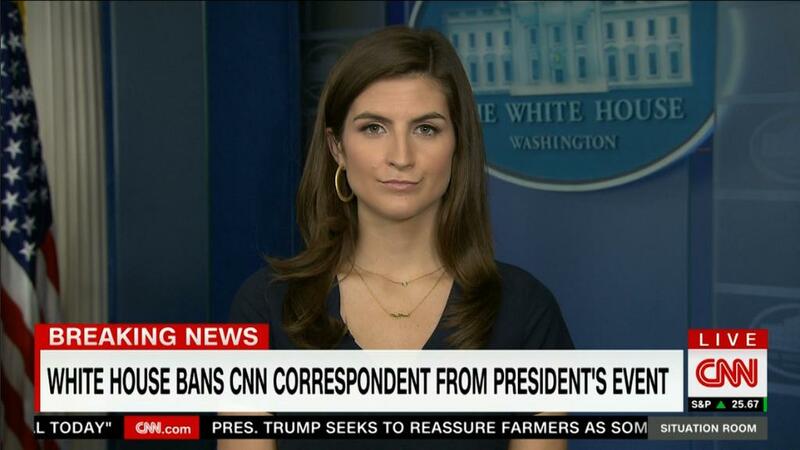 Journalists reacted with dismay when the Trump administration barred CNN's Kaitlan Collins from attending a presidential event in the Rose Garden. Two White House officials, Bill Shine and Sarah Sanders, told Collins that she asked "inappropriate" questions during Trump's meeting with European Commission president, Jean-Claude Juncker. So the ban was retaliatory in nature. And it was deeply concerning to many reporters, even among CNN's rivals. Fox News issued a statement saying "we stand in strong solidarity with CNN for the right to full access for our journalists as part of a free and unfettered press." Collins wasn't just in the room with Trump and Juncker on behalf of CNN. She was the pool reporter on behalf of all the TV networks. This assignment, sometimes known as pool duty, rotates from TV network to network each day. As NBC's Kasie Hunt tweeted, "These were questions from the TV pool reporter, which means this is effectively an action taken against all the TV journalists covering the White House." Hunt's NBC colleague Hallie Jackson added: "I stand firmly with her, and would have done exactly the same thing in her shoes." Fox anchor Martha MacCallum tweeted simply, "It is wrong to ban members of the WH pool." On Thursday, Fox News is on pool duty. The president is scheduled to attend events in Iowa and Illinois. Journalists will be watching to see if Wednesday's action by the White House was a one-off, or the start of a new and even more hostile stance toward the press corps. Trump's so-called war with the media has taken on many forms, but Wednesday's action against Collins was a serious escalation. "Blocking a credentialed White House reporter from an event open to all members of the media is highly unusual and possibly unprecedented, and it marks another low point," the Washington Post's Paul Farhi and Felicia Sonmez said Wednesday evening. Shine and Sanders might be banking on the possibility that Trump's fans will jeer Collins and cheer them on. Maybe they believe these battles are "good" for the White House. Maybe they want to intimidate other reporters. Or maybe they were just following Trump's order. "I can only assume the president ordered them to do that," CNN's Wolf Blitzer said on "The Situation Room" Wednesday evening. Within minutes of Collins' live report on "The Situation Room" about the White House's move against her, journalism advocates sprang to her defense. The White House Correspondents Association said "this type of retaliation is wholly inappropriate, wrong-headed, and weak. It cannot stand." "Reporters asking questions of powerful government officials, up to and including the President, helps hold those people accountable," the group said. Later in the day, the White House News Photographers Association also weighed in. "Such rhetoric and actions from the President and the White House that seemingly occur simply because they do not like the questions and the coverage they are getting undermine the very essence of our democratic society," the group said. The show of solidarity was welcomed by many members of the public. There have been cheers for the correspondents, including Collins, who deferred to their counterparts who were trying to ask follow-up questions during contentious White House briefings. On Wednesday, after the White House accused Collins of shouting questions and refusing to leave the Oval Office, other reporters spoke up in her defense, saying she was completely in line with protocol. CNN's Jeff Zeleny pointed out on Twitter that asking questions is what reporters do every day. "Many times, President Trump answers. If he doesn't, that's his prerogative, but no one should be banned for doing this important job," Zeleny wrote. Hala Gorani, an anchor for CNN International, reacted to the fracas by tweeting, "I've reported from many countries where reporters are banned from press events for not asking softball questions and the last thing I expected was for it to happen in the United States."